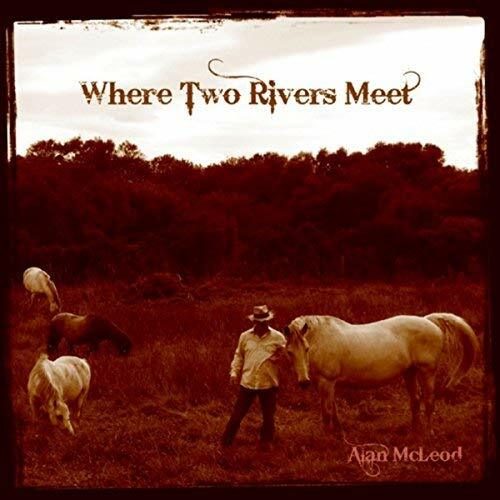 With his new country folk album Where Two Rivers Meet, McLeod once again moves on from previous incarnations, most recently as writer and lead-singer for the critically acclaimed Mad Old Punks. McLeod’s protagonists are ghosts of the past and outsiders from the present. His and their voices are stubbornly peripheral, seeking to master universal themes. A claim to a peculiar Highland ethic informs their journeys. A Highland Geist accounts for their confused identities and the eternal wars they fight within themselves. Having travelled back and forth to the States, McLeod’s new material draws on both native themes and the historical settings in which the Cleared Highlanders found themselves since Culloden. She was calling out to me …. Can you get me outta here? It’s gonna be one of these nights! Can You Shoe A Horse? What’s the wisdom of the North? Do you recall when we were boys we said we’d flee those glens? When are the tears gonna stop burning? Won’t you teach this broken troubadour how he ought to love? Fragile little lady sing one for me. But my fallen angel, my fallen angel is fragile. This is private property – no hunting! When will this hollowness end? Hey Gogo! Do you remember about 20 years ago? Hah … that’s the weather for you.